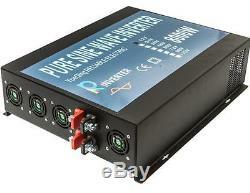 12V/24V to 120V/220V 8000W Off Grid Pure Sine Wave Solar Power Inverter. Full Power, True Pure Sine Wave, No electromagnetic Interference. No electromagnetic interference, No harm to health, Best choice for TV, radio, audio. Digital Display for DC voltage and AC Voltage. 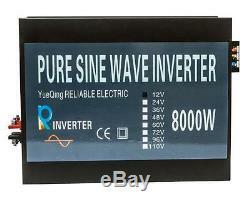 New inevrter with LED display, let you monitor the inverter input voltage and output voltage in time. With this function, you will know about the inverter condition more clearly. Inverter only has ONE DC input voltage, ONE AC output voltage. We are customer made, please leave us your message about the input DC voltage(12v/24v/36v/48v/110v), output AC voltage(100v/110v/120v/220v/230v/240v), frequency (50hz or 60hz) and socket type of the inverter, so that we can send out the inverter sooner. There is no auto-sense of the input and output voltage. MY GOAL IS TO MAKE YOU A 100% SATISFIED CUSTOMER. Cables With Clips or Car Adaptor. 10DC±0.5V or 20.5DC. 15.5V or 30.5V. 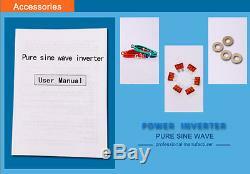 Reliable pure sine wave inverter advantages. As the core components, transfer the DC power to AC power, we use the high frequency transformer, ensure the stable and full AC output, no failure. Adapted the imported capacitor, large electricity, better performance, longer lifetime, safer usage. High quality true copper inductance, filter the wave form, ensure the true pure sine wave AC output, safeguard your equipment. No electromagnetic interference to your equipment, such as no noise for TV, FM radio, Audio. With the big radiating flange, better cooling performance, ensure the best inverter working condition. All big mosfet, larger load capacity, stable the inverter performance, supply the continuous AC output. Earthe connection for both PCB board and output, more safe for the load and the usage. The PCB thickness of 2.00mm, thicker than the most inverters on the market, allow the stronger current floating on the circuit, increase the load capacity. Thermal protection, Overload protection, Over Voltage protection, Under Voltage protection, Low Voltage protection alarm. 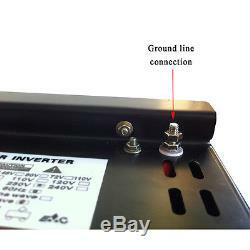 Inverter comes with an LED light to indicate the problem. When the load is short circuit, the inverter will stop working. When the use environment is stuffy, the heat of the inverter can not be radiated. 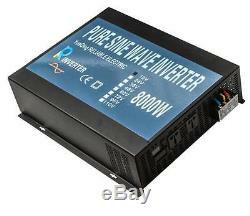 The temperature is above the rated temperature, the inverter will stop working. The battery voltage is above the rated voltage of the inverter, the inverter will stop working. The batterys voltage falls during the usage. When it is lower than the rated voltage, the inverter will automatically cut the input voltage for the self protection. It can avoid the DC high voltages surging attack upon the electronic components inside. When the appliances power is higher than the inverters power, the inverter will stop working for self protection. When the appliances current is bigger than the inverter current, the protection components on the board will be cut automatically for self protection. When the appliances resistance is bigger than inverters, the fuses on the socket will be automatically cut off for self protection. It can avoid the accidents of burning the inverter if the positive and the negative poles are reverse connected. The inverter adopts the steel alloy with high rigidity and lower resistance. And guarantee that the AC output power is stable and sufficient. The wiring terminal adopts the aviation fire proofing material. It can endure the 200A current with high safety. Use the imported extremely mute heat radiator without noise. How to choose a right inverter. If you need the inverter to run the resistive load (like laptop, TV, electric cooker, LED light), please choose the inverter with continuous power higher than the appliance's rated power. For example, for the power inverter with continuous power 2500w, it is suggested to run the appliance with rated power less than 2500w. It is best to use 80% of the rated power. If you need the inverter to run the inductive load (for appliance such as compressor, motor, water pump), please calculate the power of inverter 3 to 7 times higher than the rated power of your appliance. These charges are the buyers responsibility. All return items must be in their original condition. Please do contact with us for return address, details and any other issues. My goal is to make sure you are happy and having the pleasant shopping with us. The item "12V/24V to 120V/220V 8000W Off Grid Pure Sine Wave Solar Power Inverter" is in sale since Thursday, June 23, 2016. This item is in the category "Home & Garden\Home Improvement\Electrical & Solar\Alternative & Solar Energy\Chargers & Inverters". The seller is "lenyo-0" and is located in Wenzhou, Zhejiang. This item can be shipped worldwide.